Good morning! 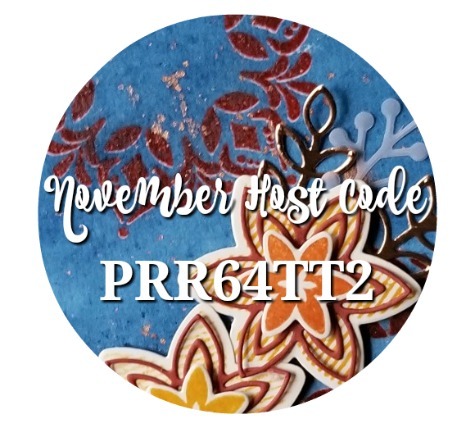 I have a fall-themed gratitude card to show you today. 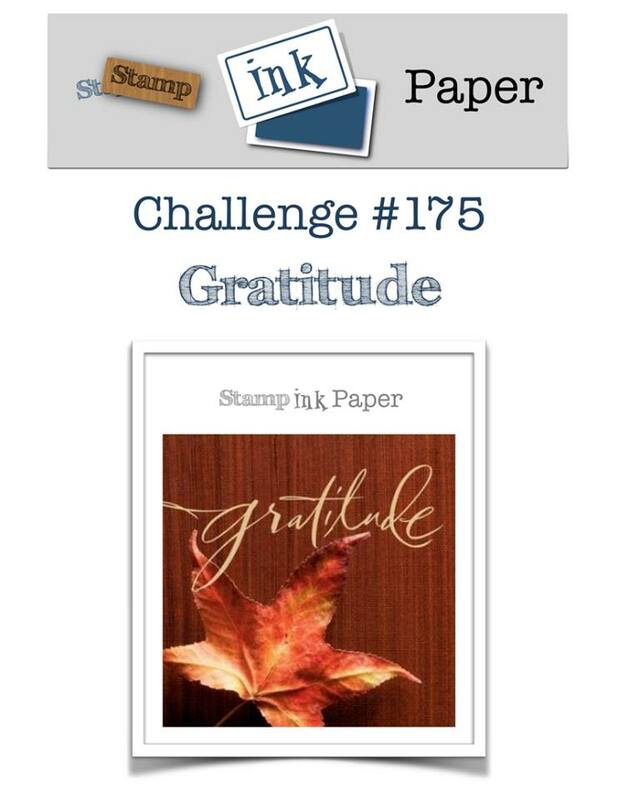 This is for our Gratitude-themed Stamp, Ink, Paper Challenge. Make sure to head over to the challenge blog and check out the design team inspiration. We’d love to have you play along this week! My card starts with a Blackberry Bliss card base. This is a book-fold card, so it’s 11″ x 4-1/4″, scored at 5-1/2″. Then I added a piece of Frosted Floral designer series paper, 3-1/2″ x 3-3/4″. On top of that is a banner of Cajun Craze cardstock, about 4″ x 1″, which I flagged with the Banner Triple Punch. My focal point is on a piece of Whisper White cardstock, 2-1/2″ x 3-3/4″. 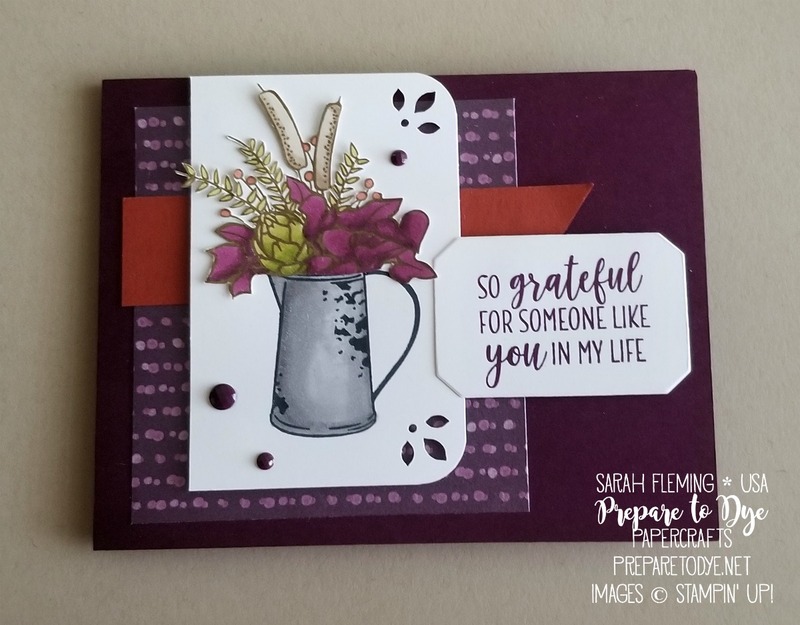 I stamped the pitcher in Memento Tuxedo Black ink, then colored it with Smoky Slate Stampin’ Blends (both light and dark) and used the Color Lifter to age it a bit. 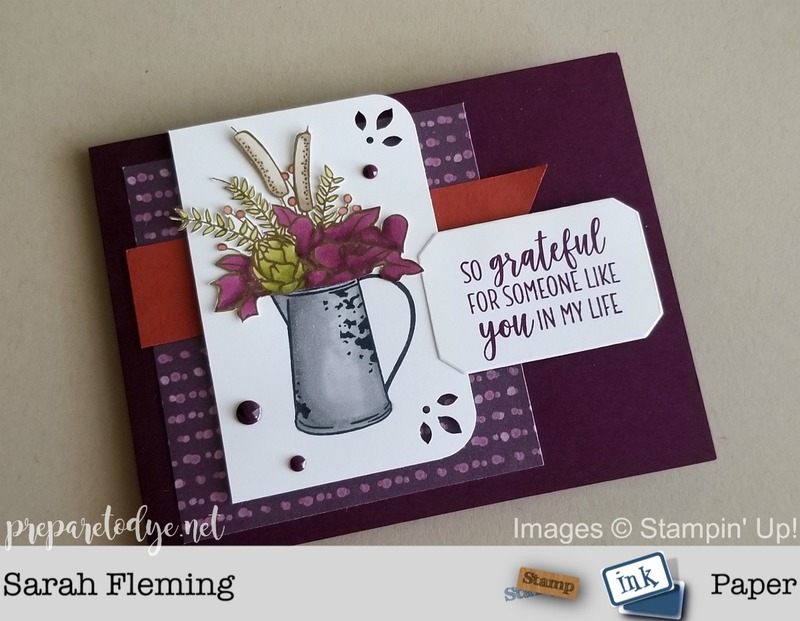 On a separate piece of Whisper White cardstock, I stamped the floral arrangement in Soft Suede ink (you can use the Stampin’ Blends with any of our classic dye inks). I colored the flowers (and artichoke) with Blackberry Bliss, Old Olive, and Crumb Cake Stampin’ Blends (both light and dark), then colored in the little berries with the Light Cajun Craze Blends. I fussy cut the arrangement with Snips and glued them to the first piece of Whisper White. I didn’t glue down the tops of the arrangement to leave the card with some dimension. I finished the Whisper White piece by rounding two of the corners and punching the little flower accents with the Detailed Trio punch. I added the focal piece to the card using Dimensionals. I stamped the sentiment in Blackberry Bliss on Whisper White cardstock, then cut it out with the Frosted Bouquet framelits and added it to the card using Dimensionals. I finished the card off with three Faceted Dots (in Blackberry Bliss).